In this edition: Mark Olson, Tom Jones, Martin Sexton, The Books, Deadstring Brothers, Noun and Jay Bennett. 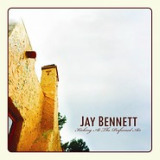 Checked out Jay Bennett’s new album. He starts with a very fine version of a Boomtown Rats tune. That brings me back to eigth grad. !